In this post, you are going to learn top 10 blogging websites like Tumblr which lets you create free blogs in no time. All these blogging platforms offer amazing features. Using them, one can create a blog easily, no need to be an expert in technical skills. 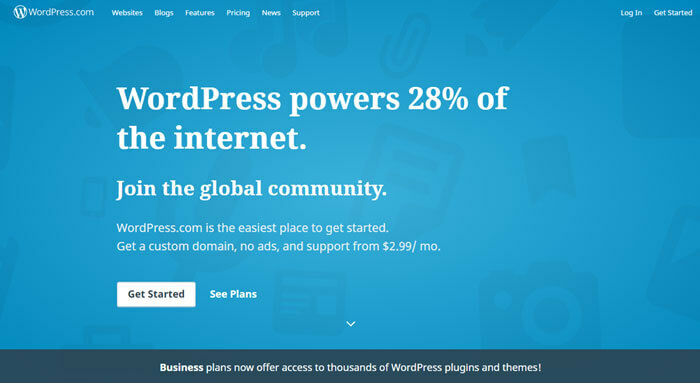 WordPress is undoubtedly the best blogging platform we have where about 28% of the overall internet websites are powered. There Barely would be any who is involved in blogging but doesn’t know about WordPress. It’s an open source content management system which is extremely reliable and too easy to work with. If you have decided to go for a free blogging platform to start your first blog, WordPress is surely the place to get started. In fact, my own first blog was created on WordPress and I can proudly say, WordPress is definitely a trustworthy, reliable and a dependable blogging platform. There are many reasons to count on WordPress as a blogging platform. WordPress lets you create your own blog for free, it’s search engine optimized and gives you a detailed analytics of your websites like where the traffic is coming from and which search query is driving the traffic to your website, huge collections of themes, WordPress plugins, and easy interface are some pluses in WordPress! Moreover, WordPress has a large help community where any query is answered with so many different and helpful answers within a very short time of putting the query. If you learn to deal with your free WordPress blog, you can go premium and start a self-hosted blog with a custom domain anytime you want! After WordPress, the second most popular blogging platform and one of the best sites like Tumblr, which you can consider for creating and hosting a free blog is Blogger. There are so many big websites which are running on this free platform for many years now without worrying about paying for hosting. 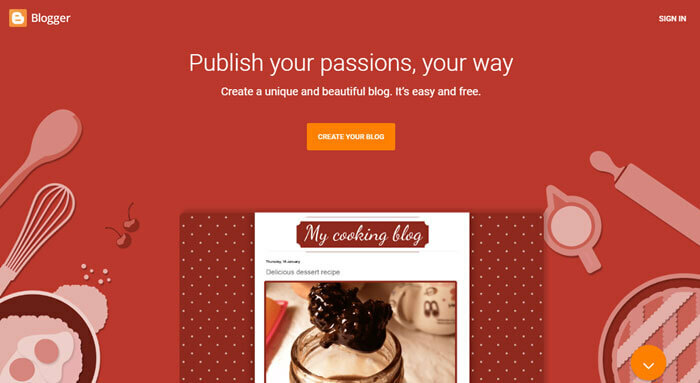 So you can also consider Blogger if you are really looking for sites like Tumblr where you can host your free blog. The major feature which makes the blogger a really trusted and authentic platform is being its Google product. Yes, Blogger is powered by Google itself thus its already search engine optimized and Adsense ready. While most of the free blogging platform doesn’t offer a feature to monetize the blog and make money out of it, Blogger is Adsense integrated. It means good money can be made from the blogger’s blog as sooner you starts getting traffic on your blog. Blogger, however, doesn’t offer as many themes and plugins option as WordPress but that should not affect you if your main purpose for starting a blog is to spread and share your thoughts, ideas, and information to the world. 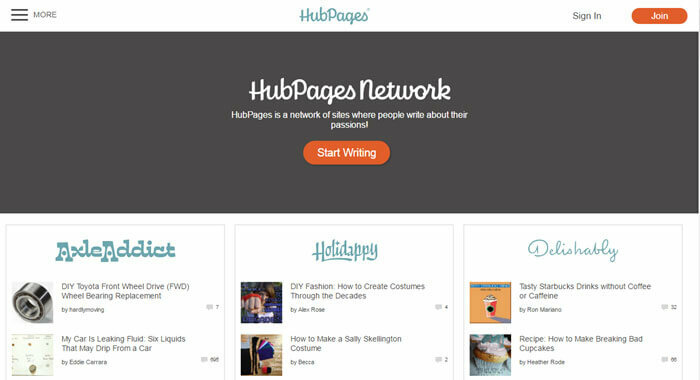 The third free blogging platform and a large community of writing enthusiasts is Hubpages. Hubpages has over 651,553 published articles and an active viewership base of Over 41,000,000 million people every month. The users of Hubpages are fondly called Hubbers and they are allowed to follow each other, interact with one another and share their thoughts, ideas, and information in form of words, pictures, and videos. Moreover, HubPages also provide its users with the ability to make money out of their blogs by their ads displaying policy and affiliate programs. So if you are still in search of sites like Tumblr which lets you create and host a free blog, Hubpages can also be considered for this! A fairly new player to the Social Media game and best alternative to Tumblr; Mamby is in the simplest possible words- Pinterest that pays, and more. It’s an A.I powered social media which lets users post content and pays them in Cryptocurrencies for those posts. The A.I helps the platform understand each user better and in more detail, as a result the feed of each user is custom-tailored for his/her interests. Apart from uploading photos/videos and Gifs to the platform, users can create complete posts as done on a blog on Mamby with a pretty advanced text-editor helping them describe their posts better; hence garnering more attention. The cherry on the top is; users can even link to their blog posts, Youtube channels and other such platforms and those links are do-follow, just what you need to boost your SERP ranks up. Registration is absolutely free, as well as a 2-click process requiring less than 2minutes at best! If you are only looking for sites like Tumblr, you might not find Posthaven a suitable platform for you, but if your major purpose is to run your blog online with utmost guaranty, security and with 100% reliability, you can consider Posthaven. The major reason which makes Posthaven apart from Tumblr is being its premium. Although Posthaven does offer features like posting all kinds of posts including text, photos, full photo galleries, audio, video, and guarantees to run your blog hassle-free online, you need to pay some amount for this. 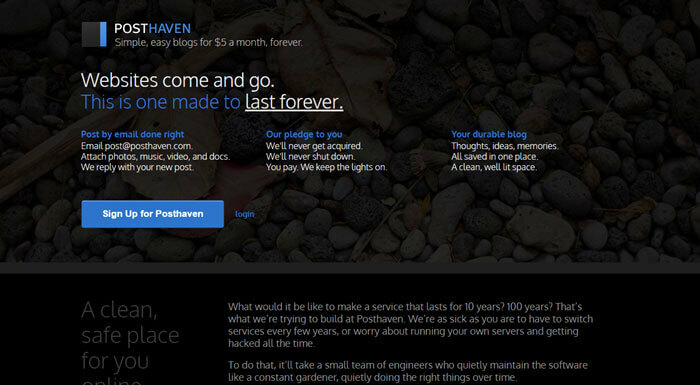 The amount charged by Posthaven for running your blog online forever, is $5/month. If you agree to pay this much of amount, you are good to go with Posthaven. There are many built-in themes offered on Posthaven, the multi-author facility, Post by email, direct post share to facebook etc are some other features which make Posthaven one of the definite sites like Tumblr and a true blogging platform. Ghost is yet another site like Tumblr which needs to be given a try. 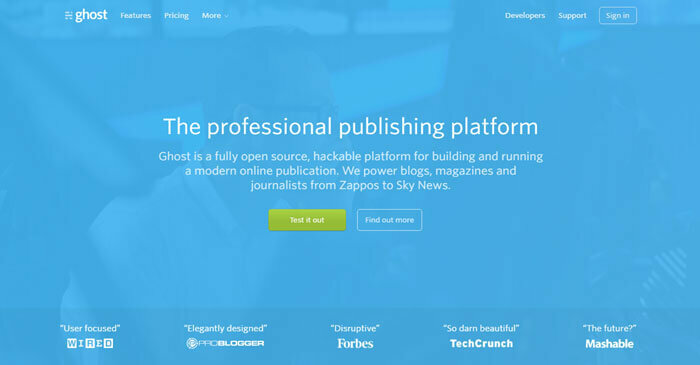 The name Ghost might sound really strange for a blogging platform but that’s what it is! We can’t complain about the name “Ghost” but we surely can count on the features of Ghost. Ghost is certainly not a power packed feature rich blogging platform but it is surely considered one of the sites like Tumblr. Ghost lacks various customization options and it’s not very flexible for users but it’s indeed a powerful platform to share your content online. Ghost is an open source platform and a non-profit organization but yet it’s a powerful place for content publishers like journalists, bloggers, and magnates. So all in all, the Ghost can be considered as the sites like Tumblr with minimal optimization options. 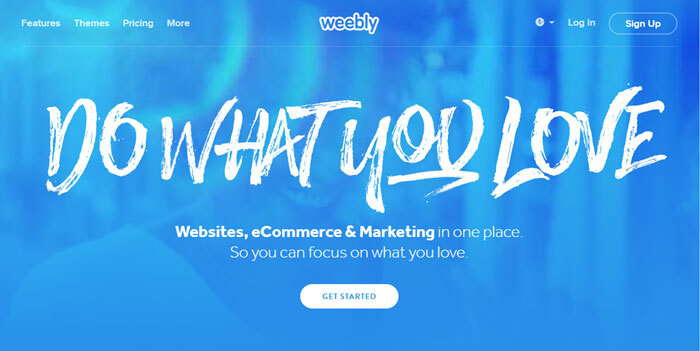 Weebly is an extremely feature rich and a full-fledged blogging solution to all your online needs. It’s not just one of the sites like Tumblr but a one and all solution to all your blogging and business needs. From small business to large enterprises, from an online store to the artistic website, from a simple blog to a full-fledged online running business, on Weebly you create a website for all range and trust me you won’t regret your decision of considering Weebly for the same purpose. 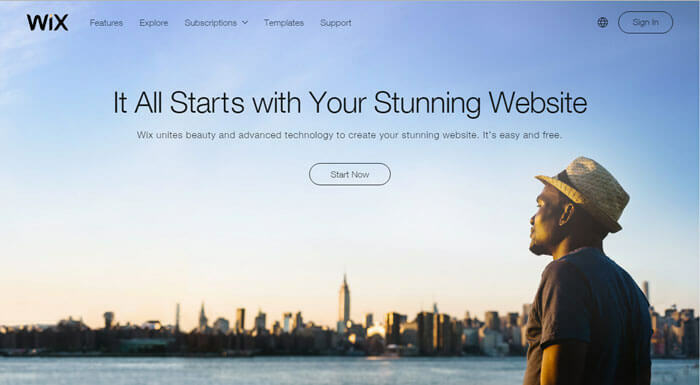 Weebly offers a huge collection of online themes, a simple drag and drop interface, full customization over your websites and almost all the features offered by its other companions. Weebly is indeed one of the greatest Blogging platforms we have, but it’s a premium solution so it might not suite to those who are low on a budget. Wix is considered as a very great free blogging platform and it’s very popular among people who loves to blog and share ideas with the world. Wix offers almost the similar features to Weebly, Tumblr, and other blogging platforms. Drag and drop interface, large collections of themes, website type ranging from a simple blog to a full-fledged online store etc are some of the features offered by Wix. Like WordPress, Wix also offers two versions, premium and free version to its users. The free version obviously possesses some limitations like limited storage capacity and a website with a subdomain like www.xyx.wix.com. But it should not affect you, as long as you are a newbie, creating your first blog and your only purpose for creating a blog is to share your content with the world. Soup is simply a great blogging platform with minimal features, clean interface and with all the similarities with Tumblr making us give it a mention as one of the prominent sites like Tumblr and a great alternative to it. 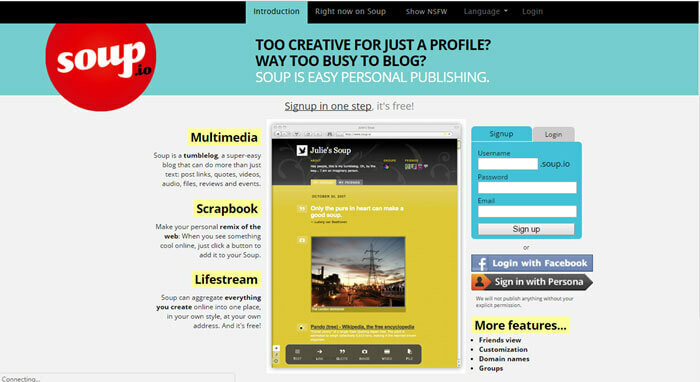 Soup might not be as popular as WordPress, Blogger, and other leading blogging platform but it surely has almost everything to offer you expect from a free blogging platform to be. Creating a free blog on soup to making your first post on it, everything is so easy and seamless that even a newbie can do that without any additional skills. Soup lets you post everything on your soup account from text to links, videos, audio files, quotes, reviews, events and everything you can think of. There are several other features offered by Soup which makes it one of the sites like Tumblr. But one thing needs to be clear, there is no any monetization option on soup like Hubpages, Blogger, or WordPress. So choose soup as your blogging platform very wisely. Medium, as the name suggests is a great medium to connect you with influencers, follow them, hear from them and vice versa. Creating an account on medium gives you the ability to explore high-quality contents from any category you like. Big writing enthusiasts and influencers share their thoughts and ideas in their respective fields on Medium, which you can follow to enhance your knowledge and ideas. You can discover great articles on medium and share them on other social mediums if you wish to. 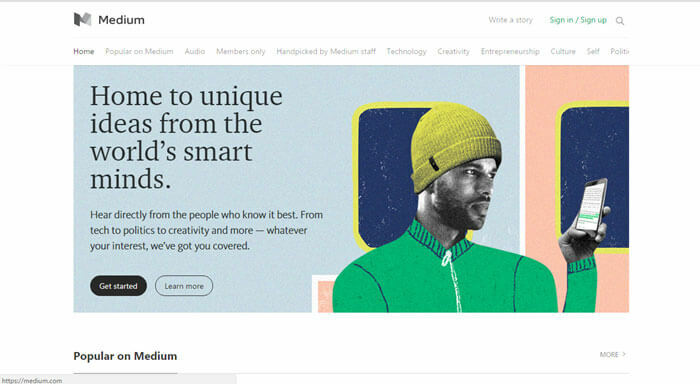 Besides, the Medium offers certainly the easiest interface which makes it really easy to get started on medium, just signing up on medium.com provides you with the ability to write your story and share it with the world. Squarespace is a full-fledged platform for everyone who is looking to start their blog, business website or anything related. Not just a blog or a website, Squarespace is designed to offer all kinds of business websites whether it’s an online store, a restaurant website, a website for an artist, musician, small business or a big business empire. 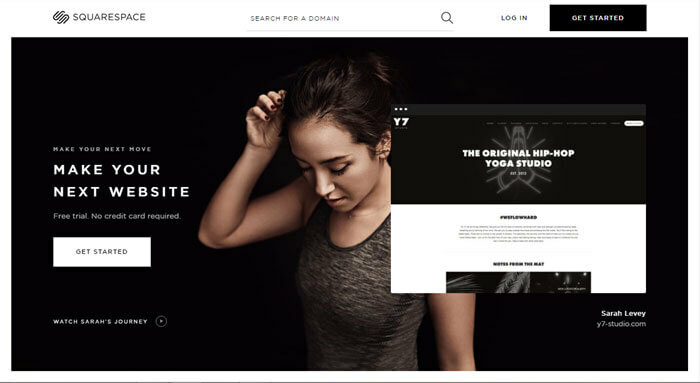 Squarespace has a big collection of ready-made themes which make it really easy to get started on Squarespace. If you are impressed by Squarespace’s features and willing to get started with it, you need to go premium as sooner your free trial version gets ended. Blogging is certainly one of the avidly growing social platforms and becoming more of a status symbol now. Having a personal blog is the fashion nowadays and people are getting more into blogging than ever. Tumblr is surely a great platform to host your free blog and get a high audience reach but like anything else, Tumblr also has some downfalls. Some People find the interface of the Tumblr chaotic and some people don’t really feel happy with the set of features offered by Tumblr. While some people, look for other sites like Tumblr just because they want to explore more options than just being hooked to Tumblr. Regardless of what reason is causing you to look for Tumblr alternatives, we are always here to help you out. We hope the article turned out a handy one to you and it met with its purpose. For any doubts or queries, the comment box is all yours. Just fill out the below form and let us know your thoughts, doubts or suggestions in the comments section below. Thanks for sharing this nice article about Best Sites like Tumblr ! Tumblr is one of the most blog website where lot publish blog post. Tumblr has such amazing & wonderful features on those attract to people. Well if we discuss about these alternate. So are also interesting Sites as most of peoples use WordPress & Blogger !